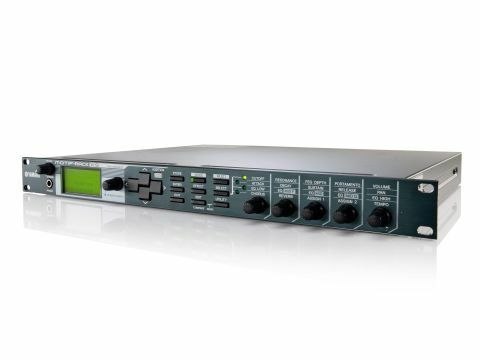 A portable rack full of high-quality sounds and presets for power-hungry musicians. Loads of essential sounds and presets. Quick access editing knobs on the front panel. Software editor for detailed programming. No sampling or sequencing. Sound can cut out when switching patches. There are five quick edit knobs, but you'll probably do most of your tweaking in software. The sampling option has been omitted from the Rack version of the Motif XS. The XS is the current top-of-the-range Motif rack model, and is equipped with the same sound engine and identical waveform ROM as the XS keyboard. However it differs from the keyboard version by lacking a couple of significant features - namely onboard sampling and multi-track sequencing. We doubt anyone will miss the sequencer too much, but we mourn the loss of the sampling option. This would greatly expand the scope for sound designers to utilise and mutilate their own waveforms in custom voices. As might be expected from a flagship product, build quality is up to scratch. The sturdy casing is all metal with reinforced front panel mounts. It might be a nice slim 1U-high unit but it's also exceptionally deep, extending back to a full 38cm. The front panel sports a power/ volume switch, headphone jack and an adequate-sized LCD with a wide viewing angle. Next along is the inevitable smattering of buttons for navigating and menu-diving. The audition button is a nice touch; press this and the Motif will play the patch using one of the many internal arp/phrase sequences. This is complemented by a row of five knobs designed for real-time control of the most essential sound shaping parameters such as filter cutoff, amp envelope and EQ. These are grouped into four layers offering quick access to a total of 20 parameters. Spinning to the rear we find two pairs of jack outputs, digital coaxial output plus MIDI I/O. The Rack-XS communicates with the computer via USB and seems equally happy whether plugged into a hub or its own port. The USB connection is used by the software editor, and doubles up on MIDI duties providing two ports within the host sequencer. Port one is reserved for the 16 Motif channels, while Port 3 can be used to send another 16 channels of data down the unit's MIDI Thru port. As you might have already guessed by the numbering system, there is a Port 2, and for the record, a Port 4 as well. This pair is used to synchronise the software editor and should be deactivated in your DAW to avoid any weird behaviour. The XS continues the tradition of high-end PCM sound modules - it's designed to tempt buyers who want a one-stop tone shop for all occasions. At one end of the spectrum it offers performers and composers a complete stock of realistic acoustic and electric instrument emulations. These are meticulously programmed for maximum expression and tastefully coated with effects, ready to drop into a mix. At the other end we find a fully-featured workhorse synthesizer. The several hundred presets range from classic mono-synth tones to rich, expansive textures, ideal for movie beds and emotive special effects. For ripping virtual analogue sounds, you best look elsewhere, though. The raw sound of the waveforms is passable when covered in effects, but the filters sound way too cold and digital, especially when you start to dial up some resonance. The stash of 1000-plus presets is certainly a major selling point for this unit. Two crucial factors are inherent to almost every patch we auditioned - excellent sound quality and dynamic playability. This easily ranks among the finest workhorse hardware sound modules available making it an obvious choice for mainstream music production and film score work. Another feature that reinforces this impression is the library of phrase sequences and arpeggiator patterns. These work hand in hand with the presets to create instant backing tracks and drum beats in music styles including pop, Latin, rock and jazz. Beyond the allure of the presets lies a world of programmability. The architecture is typical subtractive synth style, but offers a wealth of detail. To give you an idea, a voice is assembled by stacking up to eight waveforms or 'elements' and each element is a complete synth in its own right. It's all about stacking those layers in interesting ways, and if you still need more, stack some voices together in a massive multi-set. With 128 notes of polyphony, you're pretty much guaranteed to hear every note played in its entirety. The XS outputs that distinctive Yamaha sound quality, which can be described as bright and crisp in the high-ends, mellower in the mids and controlled in the bass. The XS does have a few weak points, though: it isn't expandable, and we do miss that sampler. Other minor niggles include the sound cutting out abruptly when switching patches and limited programmability via the hardware. If you can live with these issues, though, it delivers the full Motif sound in a powerful little package.